I had been looking forward to this match ever since the draw was made. I had my ticket, I had extra codeine tablets to help me get about and was all set for a great night out. Then Rover got ill.
Our spaniel was diagnosed with cancer in mid-2013 and given up to 15 months to live. He did that and two further years for good measure and enjoyed life right up until last Tuesday. On Wednesday it caught up with him. If there is one thing I love more than Saints it is my dogs and I realised I would not be able to get to the match. Rover was put to sleep surrounded by weeping women at our local vets on Thursday afternoon. Drew and I came home to watch Saints on TV – desperate for something to lift our mood. Eventually, we were rewarded. We had the same pair, Jon Champion and Jermaine Jenas, commentating who’d been at the San Siro last month. Jenas in particular had castigated Inter for their awful performance and had been flabbergasted when Saints lost there. This time Inter deserved to lose without a ball being kicked: for turning up in their dreadful blue/green away kit. The atmosphere at St Marys sounded - and looked – fantastic. The Polish officials launched the game as Champion reminded us that 6 years ago this week, Saints were playing Dagenham and Redbridge in the 3rd tier and Mourinho’s Internazionale were Champions of Europe. Now the clubs were meeting as equals. Saints were straight onto the front foot as Tadic got down the right. His cross found Jay Rod who could not keep his header on target. With De Boer sacked a few days earlier, Inter’s stand-in coach made a number of changes since our earlier meeting. One of those brought in was Ever Banega who has been linked with Saints more than once. In the 4th minute, he drove into our box but was unable to run through Maya who saw him off. Saints next attack saw panic strike the Inter defence as JWP’s cross was met with an ugly slice behind. Our #16 took the corner but the impressive Handanovic came to claim it. The home side continued to move the ball nicely so that Inter, admittedly looking rather more organised than at the San Siro, were often on the back foot. On 10m JWP found Jay Rod in a shooting position but he curled his shot over the bar. Then Redmond was impeded attempting a 1-2 with Tadic but the ref let it go as the ball again broke to Jay but his shot went awry. Tadic then carried the ball upfield before playing in Redmond who curled an effort just past the back post. Inter were definitely playing with more purpose and when Perisic set up Icardi we were grateful Virgil was on hand to clear the danger. The Saints captain broke up another Inter attack before Saints won a free kick upfield for handball. JWP’s free kick broke to Hojbjerg but he missed his kick and Inter were on the counter – until the move broke down. On 22m JWP played in McQueen whose low cross was well fielded by Handanovic. Then Rodriguez was harshly penalised for a “high boot” when his marker tried to head a ball no more than a foot off the ground. On 28m the industrious Hojbjerg won the ball in midfield to set up a chance for Redmond. Miranda did well to block his shot. A minute later Redmond won a corner but Tadic’s cross went beyond everyone. On 31m a better Tadic cross found Redmond whose shot went wide. Saints were soon back on the attack but Inter’s keeper came to claim Hojbjerg’s hopeful lob. On 40m Tadic’s run allowed Redmond to cross which the keeper punched away for the first of a series of corners. Inter’s defenders committed all sorts of fouls to prevent Saints reaching the ball but the ref was not interested in taking action. News from Prague was Sparta were 2-0 up against Hapoel so Saints really could not afford to lose this. Then, in added time, we were thrown a lifeline. A Tadic corner was partially cleared but Hojbjerg recovered the ball. As he chased it into the box it bounced up onto Perisic’s arm and the referee gave us a penalty. It was a generous decision especially after letting Inter use various wrestling holds against us in their box. Sadly Charlie was on the bench but JWP was out there and Drew and I were screaming for him to take it. Meanwhile Candreva had elbowed McQueen and should have been sent off: but only got a yellow once the ensuing ruck subsided. Unbelievably it was Tadic who stepped forward against Handanovic, a specialist penalty saver. The big Slovenian stopped Tadic’s weak effort with his legs and Saints went in still 1-0 down. Saints had dominated all the unimportant stats but still looked off-colour against a better organised Inter. Don’t know what Puel said or did at half-time but Saints approached the second period with much greater urgency. Moments after the restart JWP drew a decent save from Handanovic. Then Saints broke down the left through Redmond. The ball reached Hojbjerg who fired just over the bar. On 50m Virgil made one of his trademark runs upfield. He delivered the ball to JWP whose sweet shot drew another fine save. This time the ball ran loose but Jay could not put in the rebound. Medel was booked for a foul on Hojbjerg before Inter made their first foray forward of the half. Banega combined with Perisic down the left to win a corner off Maya. Saints comfortably cleared their lines. On 55m Hojbjerg won a corner on the right. As Tadic’s cross came over Virgil was again wrestled to the ground but again the ref did nothing. Perisic impressed me in Croatia’s early matches at Euro 16 and he was Inter’s greatest threat here. On 58m he stormed in from the wing but Maya stood firm, recovered the ball and cleared the danger. A minute later Charlie Austin replaced Jay Rod. I hate to admit it but our #9 looks a pale shadow of the player he was before injury. We’ve come to expect great defending from Virgil but alongside him Yoshida was having a terrific game. On 61m he broke up another Inter attack and cleared the danger. Saints then launched a series of attacks that finally drew them level. On 63m Hojbjerg carried the ball forward but his shot was blocked. Redmond’s follow up was also blocked, the ball going behind for a corner. For once, Virgil was able to stay on his feet and his goal-bound header was tipped over. The next corner dropped into the heart of the box where Romeu lifted it over the keeper. The ball came back off the crossbar but Virgil gratefully lashed it home: 1-1 and game on. Virgil was leading by example at both ends of the pitch. On 65m he superbly thwarted Banega in our box and launched another Saints attack. Then, on 68m Tadic made amends for his penalty miss. Carrying the ball down our left he looked up to see only Charlie in the box. Nevertheless he whipped in a low, hard cross. It took a nick off a near-post defender and hurtled into the corridor of uncertainty. 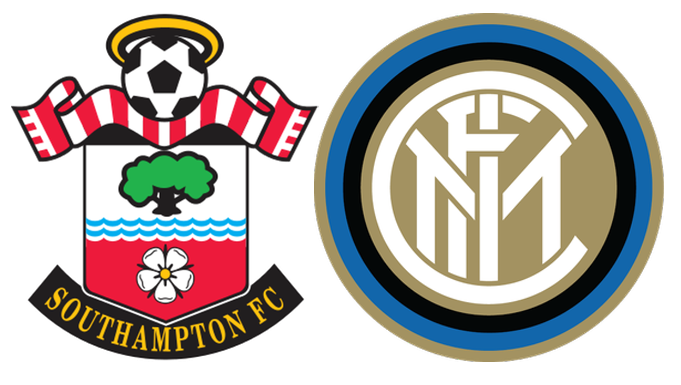 Despite Charlie being nowhere near it, the ball struck the unfortunate Nagatomo and looped past Handanovic into the net: 2-1 and Saints be praised! Saints continued to move the ball nicely. On 73m a clever run by Redmond enabled JWP to strike at goal but yet again it was blocked. Some Inter players were visibly tiring so it was no surprise when Eder replaced Medel. Saints remained in the ascendency though and Tadic found another good cross but Redmond could not get enough on his header to concern the keeper. Then Candreva won a corner for Inter but, as Redmond tried to bring the ball away, he was crudely fouled. Saints then brought on Steve Davis for Tadic. The game was getting stretched encouraging Redmond to carry the ball a long way before shooting wide. Next JWP forced a corner which he took. As the ball came in Virgil was again fouled to prevent him getting to it. Saints were moving the ball even quicker now with Davis showing some lovely touches. Inter were often chasing shadows but when they caught someone they brought them down. On 88m their final change saw Biabiani replace Candreva. In the 90th minute it seemed Charlie was in for a third but the lino put up his flag. In the 4 added minutes JWP and Miranda squared up to each other and both were booked. Saints played a competent rear-guard action as Inter’s final desperate attacks came to nothing. The final whistle delighted both Saints fans and players alike. Man of the Match: Virgil – FACT.